Mission, 9 January 1997. “Mr Whonnock,” Brian Byrnes looked on as Allan Springman, (Whonnock Community Association), centre, and Glen Kask (Mission Historical Society) signed the agreement to keep the historic records collected by the Whonnock Community Association in the Mission Community Archives. The WCA retains ownership of the records. Brian died in 2005 and Allan in 2007. Starting with the “Historical Project” in the summer of 1985 the WCA collects documents and photographs related to the past of Whonnock and Whonnockians. 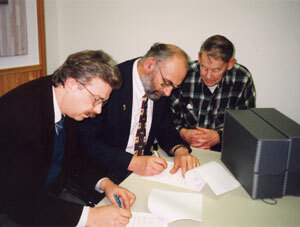 Since 1997 the Mission Community Archives takes care of the growing collection, known as Whonnock Archives. The collection is accessible to anyone interested in our past. In 2002 the Whonnock Community Association received a Heritage Achievement Award from the Maple Ridge Community Heritage Commission for the WCA’s contribution towards the conservation and enrichment of heritage in Maple Ridge. The Whonnock Community Association endorses the publication of information from the Whonnock Archives, such as the Whonnock Notes, and welcomes research using the archives as well as any suggestions and actions that would contribute to a better knowledge of the past of our community and its inhabitants. If you have anything stored away in your boxes, files, or albums related to Whonnock and Whonnockians that could be added to the Whonnock Archives please contact me. We would be very happy if we can make a copy! Give us a chance to preserve our past.